My week in Austria could never be described as a relaxing holiday; long days of snowboarding over the largest ski area in Europe, and evenings drinking copious quantities of local lager. (We also ate some excellent food provided by our chalet chef from Neilson, who are highly recommended). I'm more tired now then before I left, but wow, what a week. Knocks the socks of any boring old beach holiday if you ask me. I took the picture to the left at the top of the Hohe Salve mountain near Soll, at 1829m. We had been boarding all day and decided to stop for one beer before the long and fairly difficult home run back into Soll. It's the one beer that stands out for me from the whole holiday - sat atop a mountain surrounded by snow, having a well earned pint with a group of good friends. One thing which really made that particular bar special as well was the large, slowly rotating outdoor terrace, which means no matter where you sit you'll be unnoticeably transported to a spot with the perfect vista. A clever idea perfectly executed which means theres no need to fight for the seats with the best view, just sit down on the edge of the huge circle and by the time you've finished your beer you'll have been treated to that perfect postcard picture. 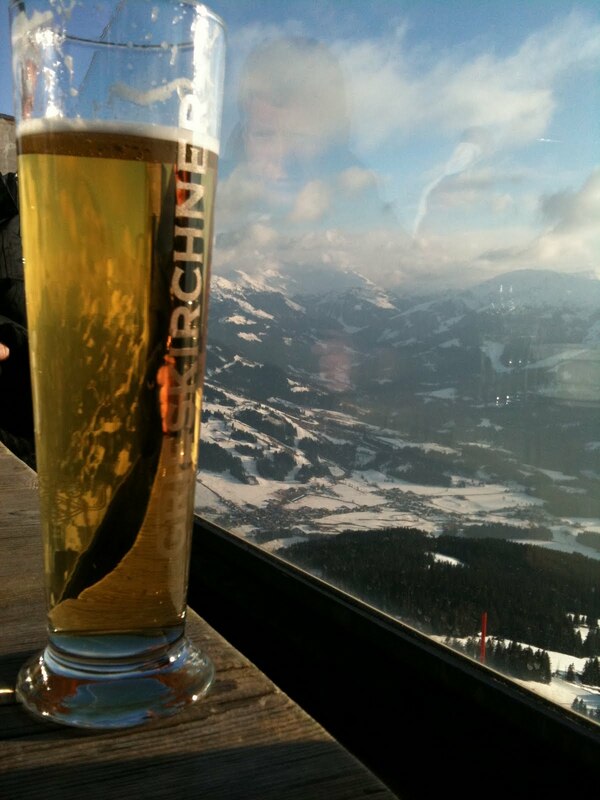 Maybe it was the view, the fact I was completely knackered, the company, or the fact someone else bought it... but it was the best beer I tasted all week. Oh and guest what? I forgot to go up to the bar and see what it was, typical. I was having too much fun to even think about making notes, but like many of the great local lager I drank in Austria I remember it being softly carbonated (the crapper ones being overly fizzy), slightly metallic in a nice way, bright, sharp and very lightly hopped with a crisp refreshing finish. But to be honest, with a view like that who cares?